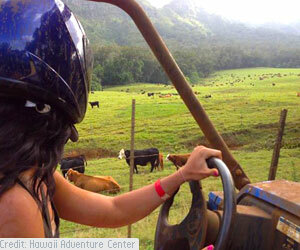 At the suggestion of the fantastic Hawaii Adventure Center, we girls booked an ATV tour in Kauai with Kipu Ranch Adventures. Let me say that again: an ATV tour. I’ve never been on an ATV. Ever. I’m not one of these country girls who grew up on ATV’s. The whole idea of an ATV scares me. I’m a girly girl. I don’t generally like thrills or bouncing up and down over steep hills. I like spa pedicures and chocolate. I’m here to tell you, IT WAS AWESOME. So freaking awesome. Skid in the mud and slam a beer into your head awesome. I have been converted. A bit about Kipu Ranch: Located in Lihue, Kipu Ranch is a huge plot of lush land that has rivers, waterfalls, tropical jungles, farmland and a ridiculous number of scenic outlooks. The Ranch is a 3,000 acre property that extends from the Huleia River to the top of Mt. Haupu. 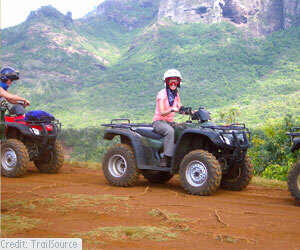 Kipu Ranch is a private ranch and not accessible to the general public which was perfect. We took the Ranch Tour ATV tour, a three hour eco-adventure. We were riding in a Teryx 4 UTV. I know nothing about this machine besides the fact that if this machine was a person, it would be Arnold Schwarzenegger: pumped up, a little crazy and a little bit responsible. The seats were comfy, which was important, because after a short (5 minutes) safety demonstration, we were off into the ranch and it was like flying. Our first stop was the lush Kauai valley. The hills of the Haupu mountain range loomed overhead, below it sat sloping green hills. I knew it at once. I knew that some scenes of Jurassic Park, which is probably one of my top ten movies ever, was filmed here, and as soon as I saw the valley, I thought “T-Rex chasing other dinosaurs.” To my delight, I was RIGHT! After that, we jumped back on our ATV and did some incredible 4-wheeling through a windy and hilly path that was covered in Kauai’s famous red dirt. I am not proud to say that I had dirt on my teeth. What struck me about the tour immediately was that I was comfortable so quickly with the whole process of it. I thought ATV’ing was for adrenaline junkies and bored country kids. NO! It was the best time ever, even for this city girl. We stopped at another gorgeous lookout, and the guides gave us snacks and drinks, all while explaining the history of the ranch, pointing out more movie scenes and facts about the plants, flowers and land. Our guides were knowledgeable, down-to-earth, and easy to talk to. They were the kind of guys you want to have a beer with, but also they were very concerned about our safety and highly professional. Our next stop was the infamous river and rope swing from Indiana Jones and the Raiders of Lost Ark. Remember the scene where he leaps onto the vine and swings to the plane? Yes, that was there, and we had the opportunity to swing out over or into the river. After that, it was major driving time. We plunged through the jungle with reckless abandon. Narrow trails filled with wild grasses, bamboo and overhanging flowering trees. Puddles and ravines, hills and steep downhill slopes that made me giggle with terror. I felt alive. Our last stop on the tour was the scenic overlook. If you recognize this land, it’s probably because you’ve seen the movie the Descendants. Apparently, a real-life variation of The Descendants movie is being staged in Hawaii court, where heirs to the Damon Estate, continue to squabble over nearly $1 billion in land. It made me sad to see that this gorgeous swatch of undeveloped land might someday be covered with condos and hotels. It’s the largest undeveloped land mass in Hawaii, and it’s beauty and stillness was striking. On our bouncy and FUN ride back, between screams of delight, we talked about how much fun we had and how wonderfully the Kipu Ranch has integrated so much into their tours: a love for the environment, a true grasp of history, fulfillment for the adrenaline seekers and city girls alike, and a family friendly tour that was undoubtedly the highlight of our trip. I might not have started out as an ATV type of girl, but I am now. Bring on the dirt!